If you are an old pro at using a chainsaw you know exactly how potentially dangerous chainsaw kickback can be. Even the most experienced sawyers know the feel of their chain catching just right and creating a backward momentum. Inexperienced cutters are at the most risk for kickback incidences, and prior to using a saw should learn about the dangers of this situation, how it is caused, and what they can do to help prevent it. Outlined below is an explanation of what chainsaw kickback is, why and how it occurs, and what steps can be taken to avoid a kickback incident. 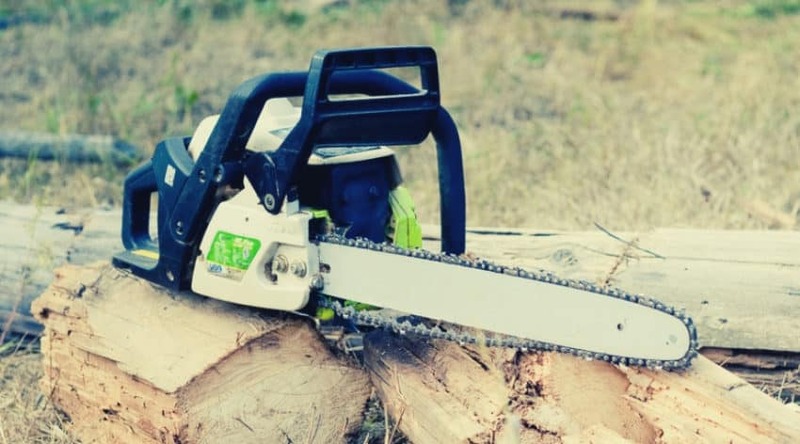 This is an integral part of chainsaw safety and is one of the most important issues to be aware of prior to ever picking up a saw as it can cause serious injuries or even death. How Does Chainsaw Kickback Occur? 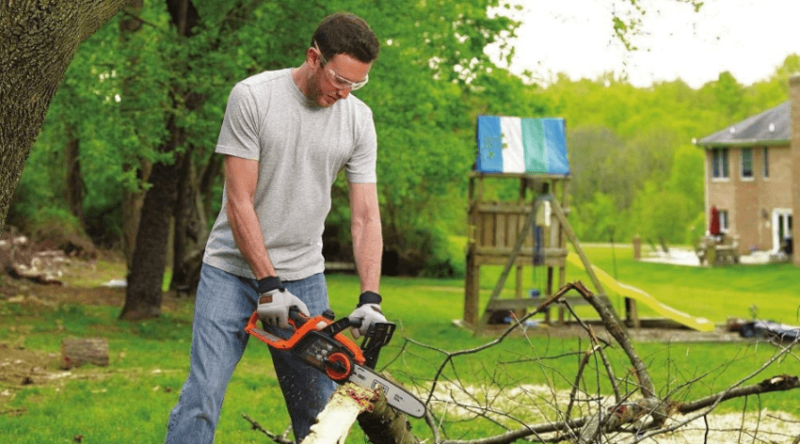 How Can You Protect Against Chainsaw Kickback? What is a Low Kickback Chain? Kickback is the accepted term used to describe a sudden upwards motion of the guide bar while the chain is engaged in cutting. 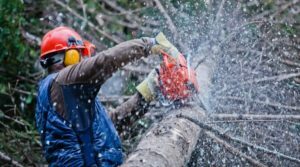 This can take place in both electric and gas-powered saws, and is an incredibly dangerous situation, but is avoidable with proper knowledge of why it occurs, and injuries resulting from kickback are almost exclusively avoidable. 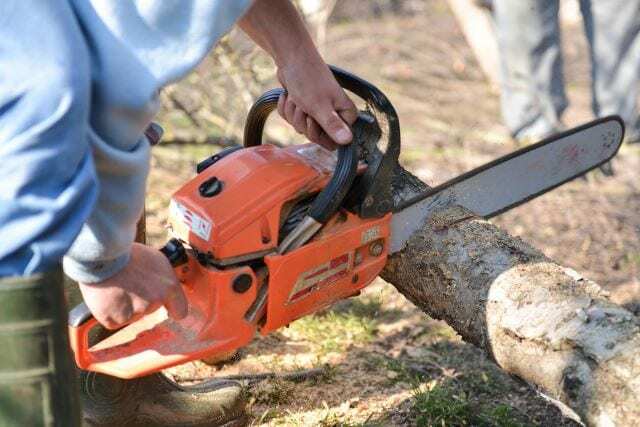 Not all kickback situations are violent in nature, and may only produce a nudge backward but all chainsaw user should be aware of the potential this can have. 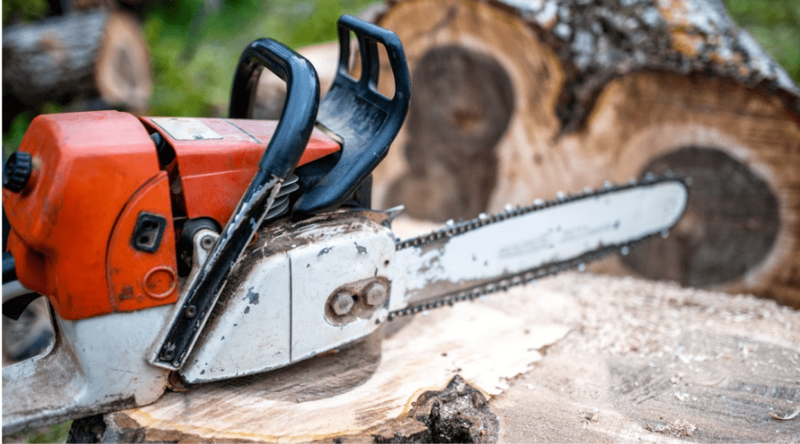 With over 90% of treated chainsaw injuries attributed to operator error and poor judgment surrounding safety, it is important to understand what steps can be taken to avoid this situation, or how to best protect yourself if it does occur. When a chain is forced upwards and back by the momentum of the spinning chain, it will follow the path back through what you were cutting. This is often back towards the operator, creating a possible situation that includes a moving saw coming into contact with the operator themselves. Unfortunately, it is usually the top half of the body, including the head and face, that are included in the kickback zone. Two different scenarios have the potential to create chainsaw kickback. Both have the same results, and both can almost always be avoided with knowledge of how your saw works, and an awareness of the material you are cutting. Despite this, most sawyers will experience kickback of some degree when cutting either due to becoming too comfortable in their saw use, an unawareness of how their saw and material interact with one another or due to an unexpected cutting situation. The very top front of your chain, and the tip is the kickback zone area and when you touch a spinning chain to a cutting surface along this area you have the potential to feel the kickback. When cutting you want to use your top or bottom flat cutting surface rather than the tip of your bar to avoid this situation. Kickback can also occur when the bar and chain become pinched as you are cutting. This most often occurs when bucking timber into logs on an uneven surface. Always double check what your logs are resting upon or on prior to cutting. 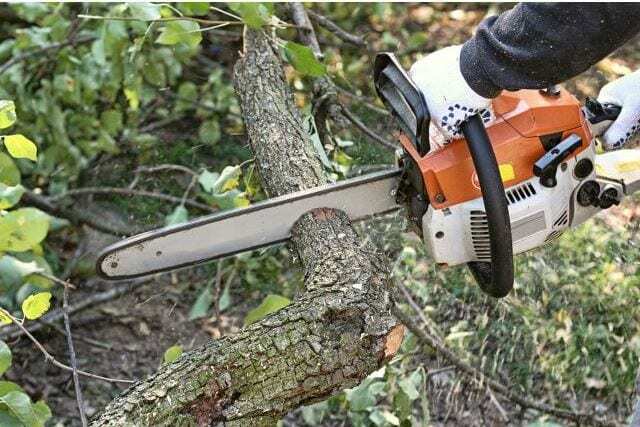 As mentioned, even the most experienced sawyer can experience kickback, but luckily some basic chainsaw safety can help keep you protected from this. First off, chainsaw maintenance should always be a priority. No matter whether you run an electric or gas powered saw, all have the potential to be extremely dangerous, and the simple maintenance checks and care can help create a much safer working environment. Dull chains, improper chain tension, poorly installed parts, and incorrectly sharpened cutters, and depth gauge issues can all increase the chances of kickback. Knowing how your saw works and what the parts are is an integral part of chainsaw ownership. HEALTH AND SAFETY CONCEPT. Personal protective equipment on wooden table over black background. You also should always wear the proper Personal Protective Equipment (PPE) when running a chainsaw. 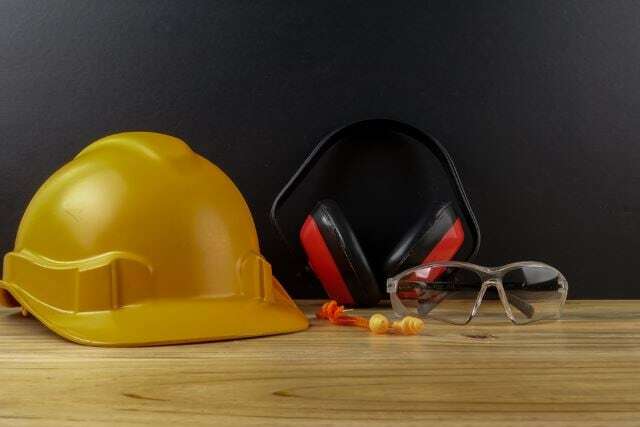 This includes a helmet (especially when cutting in forested areas), eye and ear protection, long sleeves, kevlar chaps, and sturdy boots to help protect you from a spinning saw blade if an accident were to occur. Even though an injury may still result, having had this protection helps create a non-life threatening situation and can protect you from the worst of the danger. 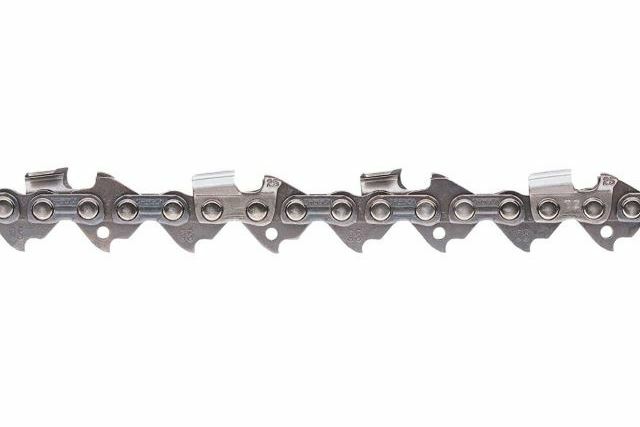 Most, but not all, chainsaws have a chain brake that disengages the chain when engaged. It is located in front of your left-hand grip and can be used when you push against it with the back of your wrist. 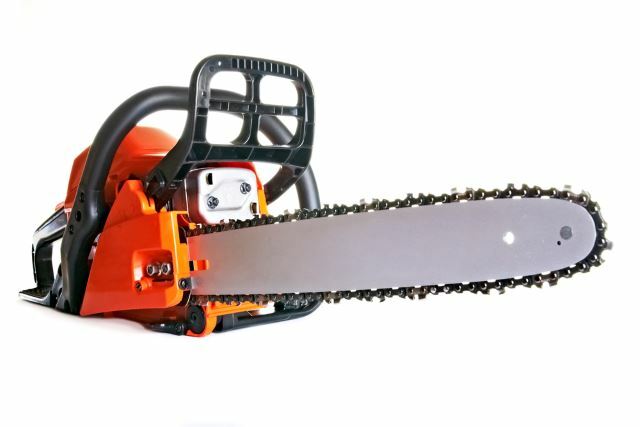 If your chainsaw kicks up and back it should automatically push up against your wrist to engage. It is important to make sure brake is working correctly, and that your saw idles without engaging the chain. If your chain moves with the brake on, your brake may be working incorrectly, or your saw may be running too rich. If this is the case you can adjust your carburetor settings fairly easily with a little patience. Some chains minimize the chance of kickback from occurring. In fact, all saws under 66cc engine displacement require it to be sold with a low kickback chain. Of course, most chains can be independently replaced, but it is not recommended. These chains work by limiting the amount of fiber that can catch up on the bar as it turns the kickback zone. This can be done in various ways, but the most common is to add an extra amount of metal between the cutters. There are drawbacks to this kind of chain despite the safety it provides. It renders the saw useless for bore cutting which is not conducive for tree felling. But for most bucking, limbing, or firewood cutting, it doesn’t become an issue. It also can be difficult to sharpen. 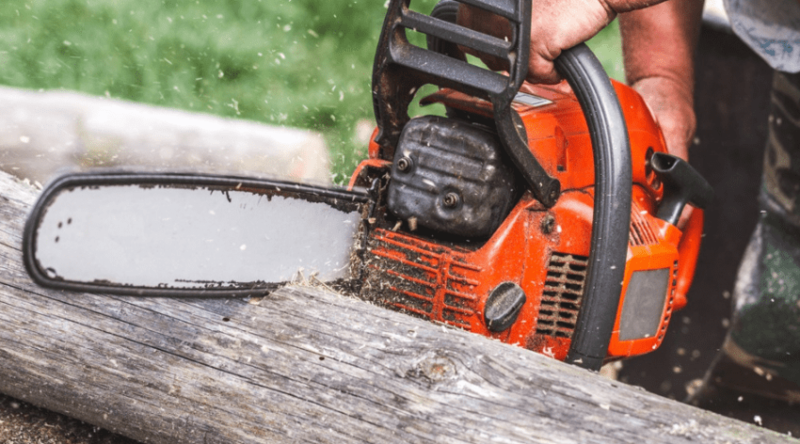 If you are new to chainsaws, or simply need a good reminder, chainsaw kickback is a potentially dangerous situation for the unprepared. Knowing how and why it occurs can help keep you safe, and taking the precautions to protect yourself against it is always recommended. 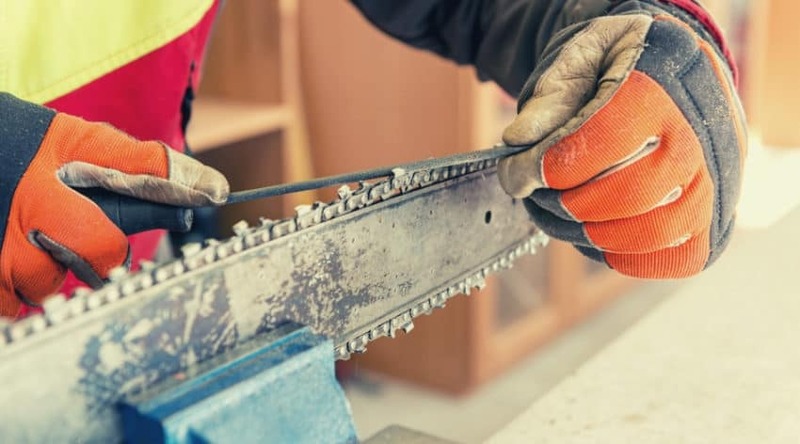 Whether you use a low kickback chain or not is an entirely personal preference, but be aware that most saws marketed for homeowners will come standard with one. If you have any further questions please let us know in the comments below. And, as always, please share!